Every dress-ups box needs at least one cape, preferably several, for any fancy dress situation. 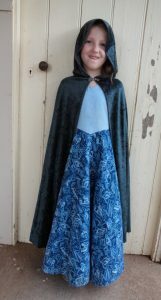 A cape can outlast those fairy dresses, cowboy vests and Buzz Lightyear suits and still be going strong at fancy dress parties a decade or two later. This adult or child-sized cape is a semi circle of fabric with a hood pleated on. The front edges meet edge-to-edge with a single hook at the throat. 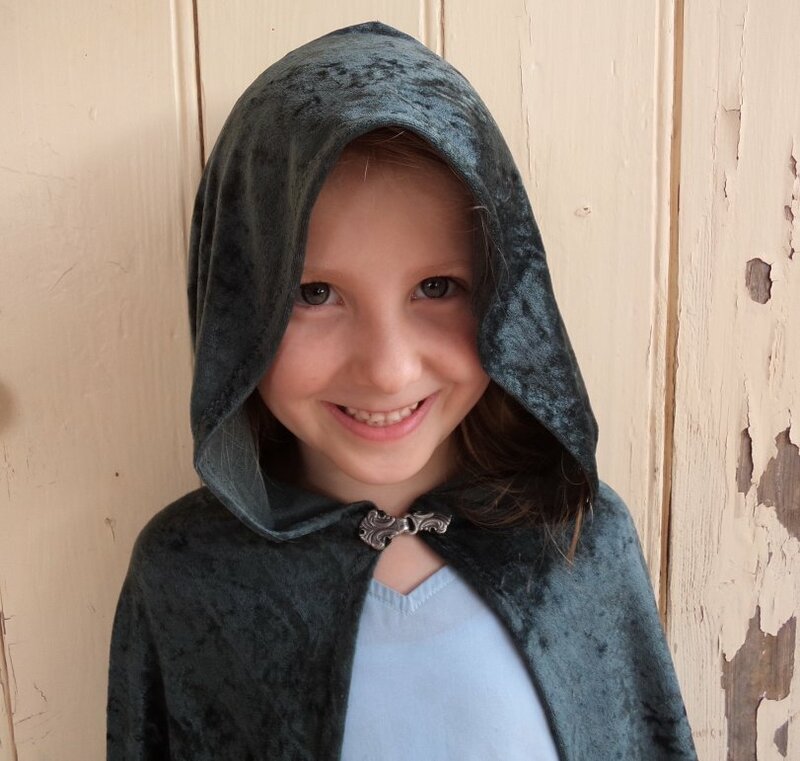 The child-sized cape in green crushed velour knit, modeled by my favourite five year old. This is the adult-sized cape modeled by me. The fabric is from an old curtain. The back view. Yeah, I know, it looks like a rain cape here. 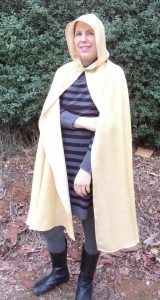 The same adult-sized cape worn by my favourite seven-and-a-half year old. The green one fits her better, but this is ok -just roomier. The best fabrics are drapey and lightweight. If you choose a thick fabric, your cape may be uncomfortably heavy to wear. Old, full-length curtains can be good (and cheap!). 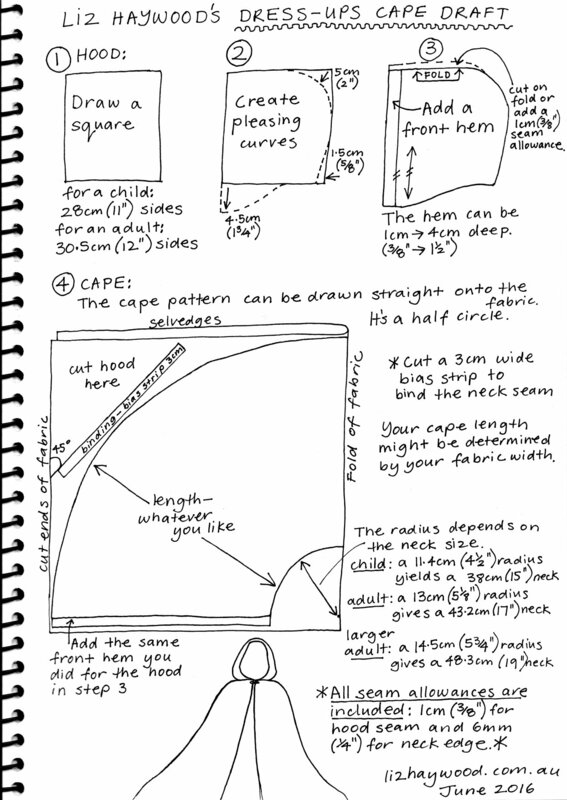 Check that the fabric is wide enough; in fact, your cape length may be determined by your fabric width. Here’s the step-by-step guide; scroll down to the end for the summary if you want the overview first. 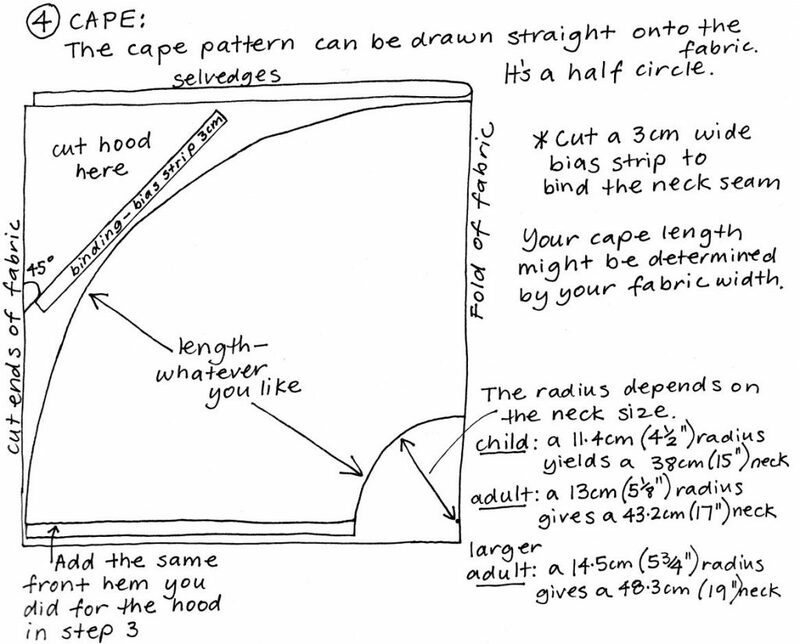 We’ll make a paper pattern for the hood, but the actual cape can be drawn straight onto the fabric. You can make a pattern for it if you wish, but it takes a lot of paper. 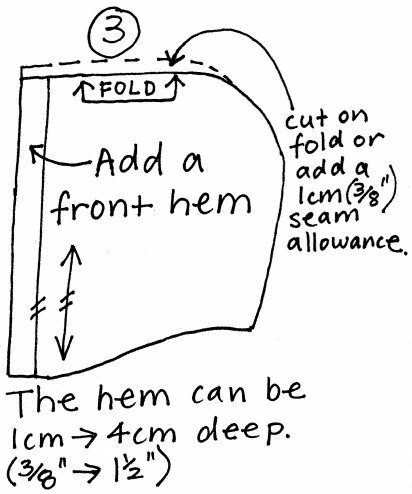 Note that seam allowances are already included in this draft: 1cm (3/8″) for the hood seam and 6mm (1/4″) for the neck seam. 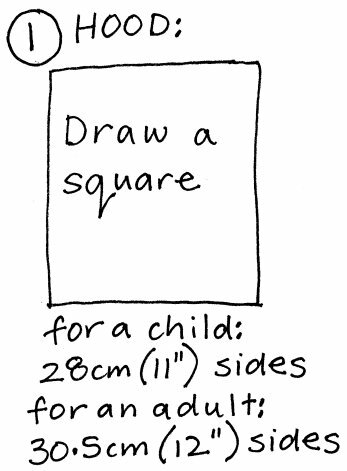 Begin by drawing a square on a piece of paper. 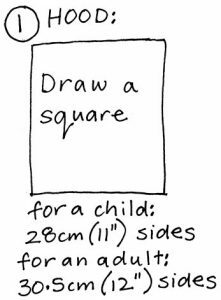 If you are an adult with a really big head (or big hair), consider making the square bigger. Also note that an adult hood will fit a child; it will just be roomier. 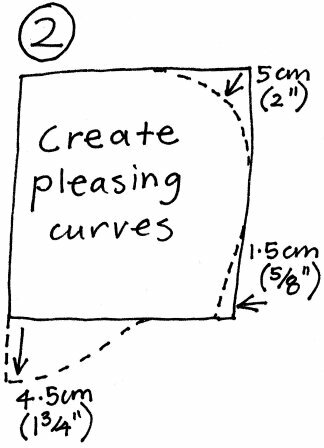 Mark in the measurements as shown, and draw in curved lines. 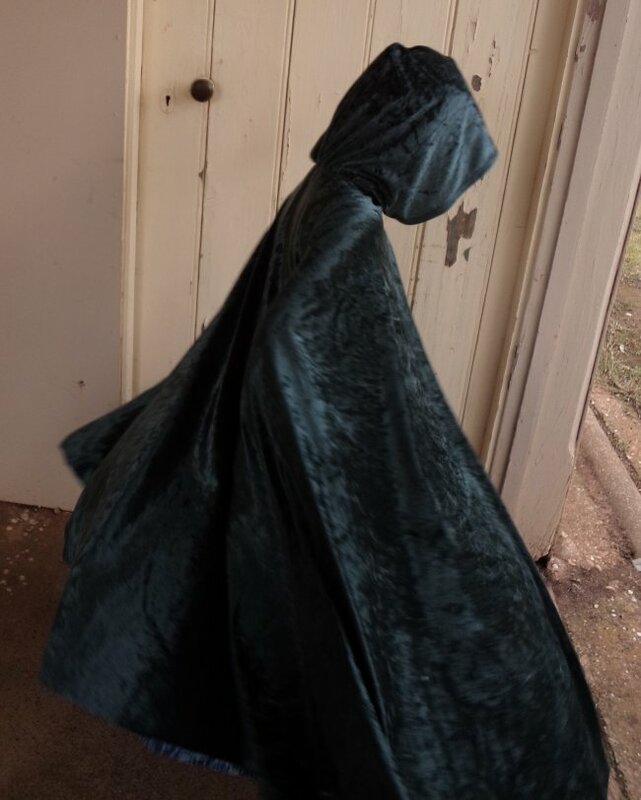 If you don’t recognize the shape yet, the top of the square will be the top of the head, the right side is at the back of the head, the left side will be around the face, and the lower edge is the neck and will be sewn to the cape. The hood pattern is nearly complete. Add a front hem to the left side as indicated. 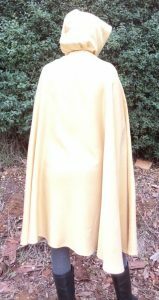 The green crushed velvet cape has a 1cm hem, and the gold cape has a 2cm hem. Draw in a grainline parallel to the front edge. 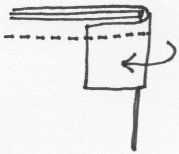 The top edge should preferably be cut on the fold, so you don’t see a seam line around the face, but you may not have space to do this on your fabric. Instead, add a 1cm seam allowance at the top only and cut 2 of the hood. Hood pattern finished. Step 1. Before you handle the cape too much (ideally before you shift the cape off the cutting table), stabilize the neck edge with tape. 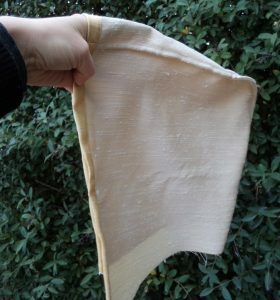 You can use 6mm cotton tape, but I used a narrow strip cut off the selvedge (you can do this too if the selvedge is good enough). Cut the tape the length of the neck + the hems at each end. Mark the centre so you can match it up. Pin and stitch the tape next to the edge, on the wrong side. The tape pinned, ready to stitch. Step 2. Sew the head seam in the hood to create, well, a hood. There’s a 1cm seam allowance. 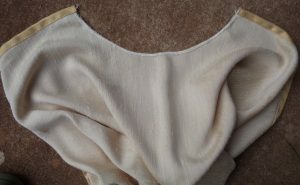 A French seam is best to use for a neat appearance when the hood is back. The seamed hood. I’ve gone onto step 3 and hemmed the front edge, too. 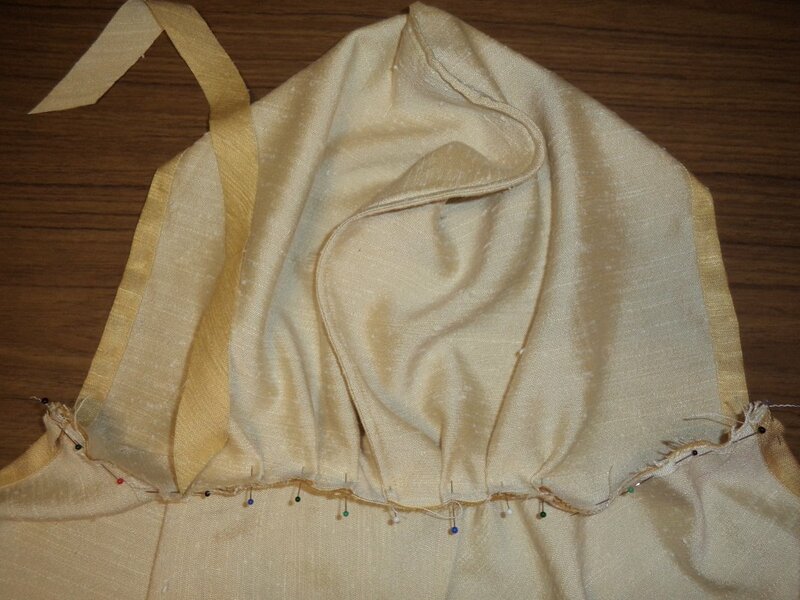 Note that this hood has a seam at the top of the head -a fold would have looked better but there wasn’t enough fabric. This hood is now ready to attach to the cape. Step 3. Hem the front edges of the cape and hood. 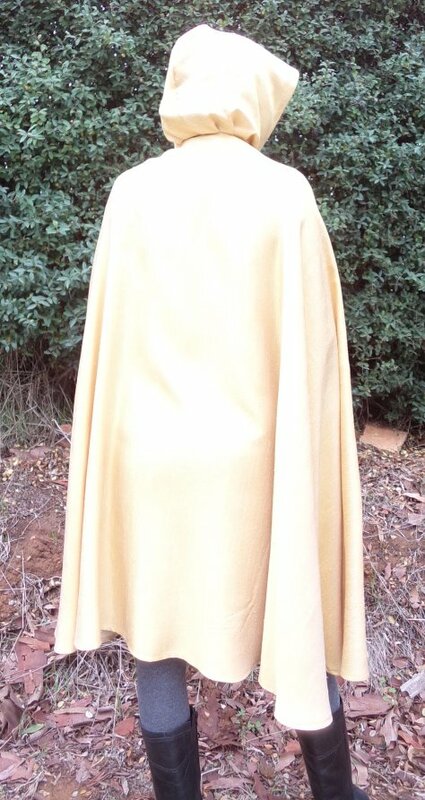 The top edge of the cape with the neck stabilized with tape and the front edges hemmed. It’s ready to be attached to the hood. Step 4. 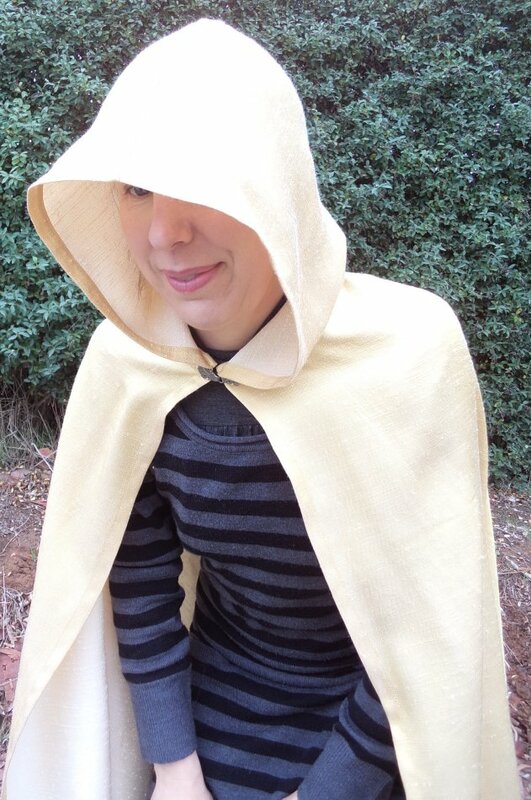 Pleat the hood onto the cape, with right sides together. Pin the right side of the bias strip onto the wrong side of the hood. At the ends, wrap the bias strip around the layers for about an inch, and sew together. Sew all three layers together with a 6mm seam, sewing with the cape side uppermost. Finish off the binding by folding it over the raw edges and hand sewing it down. 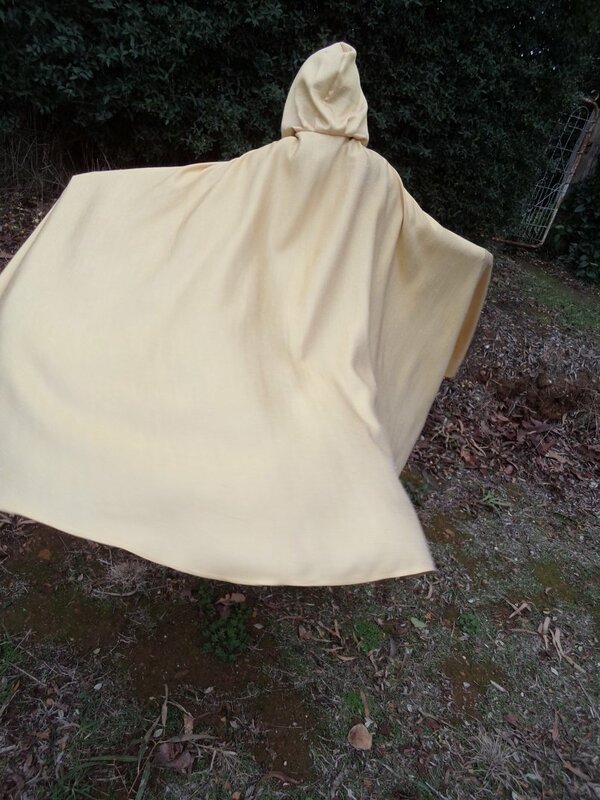 The hood and cape pinned together. 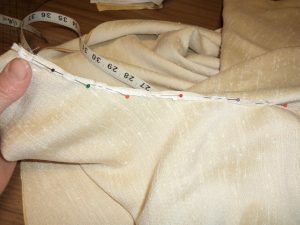 The excess fabric in the hood has been pleated evenly before attaching it. The binding strip has been partly pinned on. Fold the binding around each end to make a neat start and finish. Stitch through all the layers. Step 5. Hem the cape. 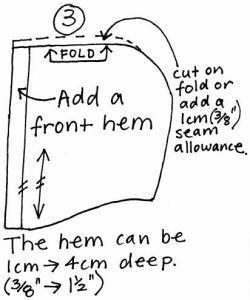 The hem needs to be narrow because the edge is curved. If the fabric doesn’t fray you can leave it unhemmed -I did this with the green crushed velour. 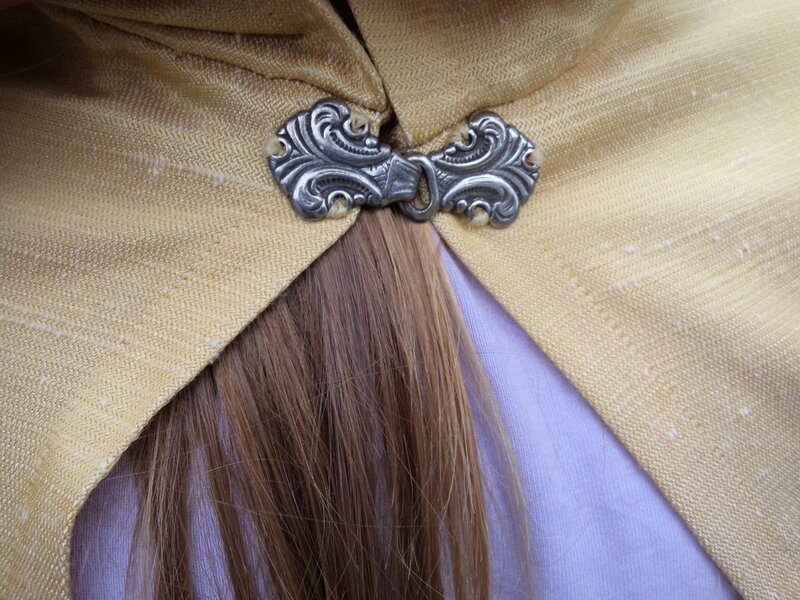 For the gold cape, I overlocked the edge, turned it up 1cm and machine stitched. You could also babylock the edge. Step 6. Sew a hook at the throat of the cape to do it up. You could also use a button and loop. If you prefer ties, cut the bias strip for the neck longer to form the ties as well. I used a clasp intended for a Scandinavian jumper (that I am never going to get around to knitting). Tape the neck of the cape to stabilize it. Sew the head seam of the hood (1cm seam). Hem the front edges of the cape and hood. Attach hood to cape and bind seam (6mm seam). Update: I wore the cape to a Pirates and Princesses fancy dress, not long after. It was a very successful costume.